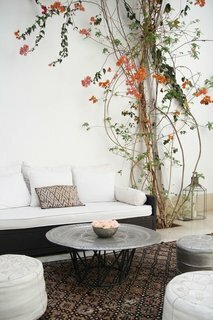 Looking for creative ways to incorporate rugs into outdoor spaces that feel otherwise unfinished? These 10 examples will give you the inspiration you need to get your yard ready for spring. Even though the groundhog saw his shadow, homeowners and renters alike are prepping for spring. With that, the focus on designing or refreshing outdoor spaces is top of mind. 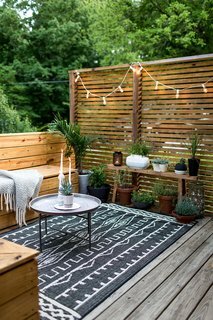 Outdoor rugs can be used in the same way they're used indoors—to finish spaces, establish zones, and provide spacial depth. Check out these 10 spaces that do this strategically and effectively. Mike and Megan Gilger of The Fresh Exchange used a monochromatic color palette to redecorate their outdoor patio. A black-and-white rug makes the main sitting space inviting and comfortable. 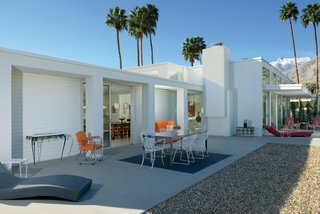 Modern and minimal doesn't mean unlivable—rugs make outdoor spaces inviting. An outdoor rug can help you clearly define a dining area, making it feel like it has its own dedicated place that's separate from the rest of the open yard. Kings Point—located at the Indians Canyon Golf Resort—is home to 44 condominiums designed by Dan Palmer and William Krisel in 1968. High ceilings, ample clerestory windows, and extensive views of the Jacinto Mountains are among their defining characteristics. 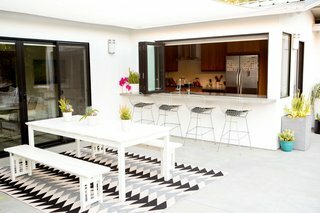 Photographer Lou Mora and blogger Sara Mora used a patterned rug to create a geometric tile effect against the concrete slab that makes up the majority of their home’s backyard. Bring asphalt patios and concrete backyards alive with rugs, plants, and monochromatic colors. NousDecor used artificial grass (yes, astroturf) in place of rugs for their client’s rooftop outdoor space. The astroturf is easy to clean by draining it after it rains or hosing it off when it's dirty. Drought or desert-scaping doesn't have to feature only succulents. 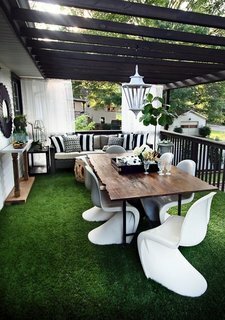 For rooftop spaces, high-quality astroturf is low maintenance and a great grass replacement. 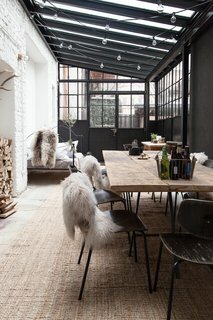 When this German factory was turned into a home, the homeowners used sisal rugs to balance their love of modern and vintage industrial decor on their covered patio. It does the same job as an outdoor space—but just covered so that it can be used year-round. Though this sunroom is technically enclosed, it serves as year-round gathering area that acts as an outdoor space—even during the cold German winters. Though this front patio space is covered overhead and from one side, it's fully connected to the outdoors via wide shutters. It shows how rugs can create a smooth transition between indoor and outdoor spaces. 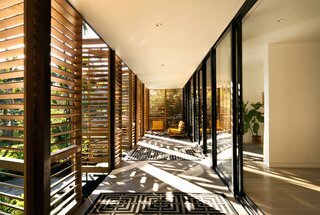 The shutter system creates a stunning interplay of light in the front patio space. At night, the shutters glow in the streetlight, "creating the sense of a magical Japanese tea house," according to resident Melissa Brillhart. Homeowners can experiment with a modern Bohemian style by incorporating Moroccan elements into their design. Poufs, pillows, rugs, and metal top tables create a striking contrast against white cushions and dark wood frames. Moroccan rugs, leather poufs, and hand hammered silver tables make stark spaces comfortable. 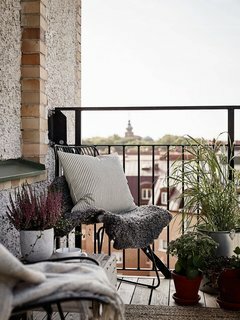 Small outdoor spaces carry big impact. 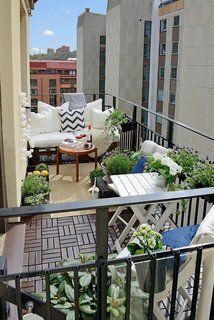 Use patios and balconies to extend square footage in the city. 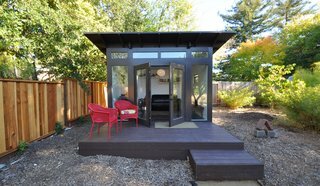 When working with a shed, small studio, or extremely limited square footage, a simple welcome mat and a classic outdoor chair on a small patio can carry the same impact as a full-blown outdoor space. A raised deck with bold chairs and simple welcome mat finish this work retreat. Similar to your indoor space, don't be afraid to layer. An outdoor rug can add another element to your combination of textures. For city dwellers, a quick trip to your local Target, Home Depot, and IKEA can yield big, affordable results.